***This was a random idea to back up the La'Taro enemy I posted before. I do not know if MG or the others have plans for stuff to do after the events of KoT, but I just wanted to throw this idea out here before I forget it lol. I know it is a bit early to say this but what I thought of is like an extra adventure after, if the player wishes to do ti or not. But like always, a suggest if you guys are interested. The area is like a forest, however, it is underground. The La'Taro blocked off the inner parts of the cave in order to prevent access to their land. The only is a cave in the Lost Woods that is currently the only entrance/exit to this village. There is one entrance that is located in The Lost Woods within a dark cave. The player will see that there will be boulders that block the path and gaps along the way. If the player beats the game and come back here, they will begin to chase a hooded figure here, for he will easily destroy the unbreakable boulders and run away, giving the player a chance to get through. This land is mention in torn apart books in the Koriki Village. Only bits of information can be read about it. 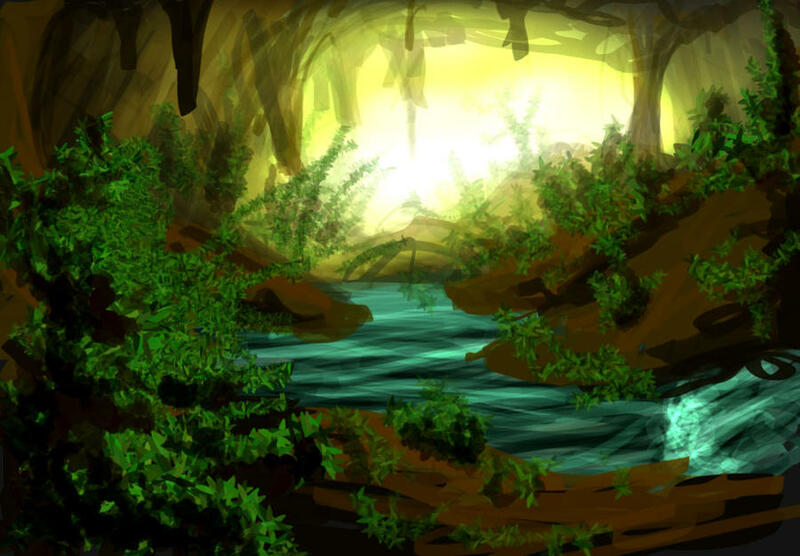 The La'Taro at some point befriended the Koriki, seeing that they are children, but after discovering their demise, they escape into an underground forest area, and made their home there. The father of Halima. At some point he escapes the village and drops his daughter at an orphanage in the place that is now The Hyrule Slums. He left a few letters and some equipment for when his daughter is ready to come back, she will use the items to get threw the boulders he and his men sent up in the caves. The name of the bad guy in the story. He seeks revenge on his brother, and manges to kidnap Halima, and threatens to kill her if his brother does not come forward to face him, unarmed.He seeks to take over Viridas. A La'Taro warrior that aids Link in Hashim's raid on the village. He is an archer and a close combat fighter that will come to Link's aid in various situations. The hooded Girl Link meets with, while venturing in The Lost Woods cave, after KoT events. She later tells Link her real name, and why she finally decided to go and to her birth village. Link can also find a later, before this event in her diary saying "My dear, when the time is right, when you become a young woman, return to the village. For I by the time will deal with this threat that is threatening our young." After the events of KoT, Link returns to the slums of Hyrule, only to hear about a girl known as Lisa runningaway, Link discovers where she has gone from her friends and decides to go after her. Link catches up with Lisa, the hooded girl, into the Lost Woods, and entering a cave there. During the chase, the girl used a special type of bomb that breaks the moss boulders inside the cave. After chasing the hooded figure, she will tell Link that they are looking for trouble and begins to fight Link. After Link easily overpowers the hooded figure. Link then removes the hood and sees that the person he fought was a teenaged girl. He explains to Link that she has discover who she is and where she came from, in addition, she says to Link that her time of living in the Hyrule Slums are over and wanted to seek out her father. Link offers his help, but the girl refused and smacks him in the face and says to him that he shouldn't be trying to hit/fight girls and she takes off. Link now curious of this land continues forward to see if there is any trouble that the girl gets into, he will be there to help her. The Antagonist, Hashim - As of now, I need to develop ideas for this part, but the story here is that an evil La'Taro of the other tribe escaped his place of imprisonment and seeks out revenge on his brother, the father of the girl. The bad guy slaughtered The passive LA'Taro marksman within a fort at the end of the woodland and takes his stay there. He advises his men to make his brother miserable, by killing, kidnapping people in Viridias Village, he manages to kidnap his brothers Daughter. The player can get a key to get inside the fort by taking down 3 of Hashim's genereals who are currently located in camps in the woodlands. Like I mention before about the race, they are divided into tribes. So you will be able to recognize the bad ones when you see them. Blue Cuccos and other animals can be found here. Getting There(After KoT story): The player can only comes here after beating the game, it will include an area where the player can explore and upgrade their weapons. Also includes an extra dungeon, which will match Hero's Cave, but the difficulty will be higher. Working up something to post here later.